Across industry, many definitions are used when it comes to the different types of maintenance. It can quickly get confusing when people talk about preventive maintenance, condition based maintenance or predictive maintenance but actually have something else in mind than you do. Some people get very excited about these definitions and can spend a lot of time on for example disagreeing with what is and what isn’t preventive maintenance. Let’s not do that, instead, I’ll offer you my view of the different types of maintenance and more importantly, when to use them. As far as I am concerned terminology is not important. Other than making sure we are talking about the same thing. If what I consider to be condition-based maintenance you call predictive maintenance that doesn’t really matter. As long as we can sensibly talk about the underlying principles. 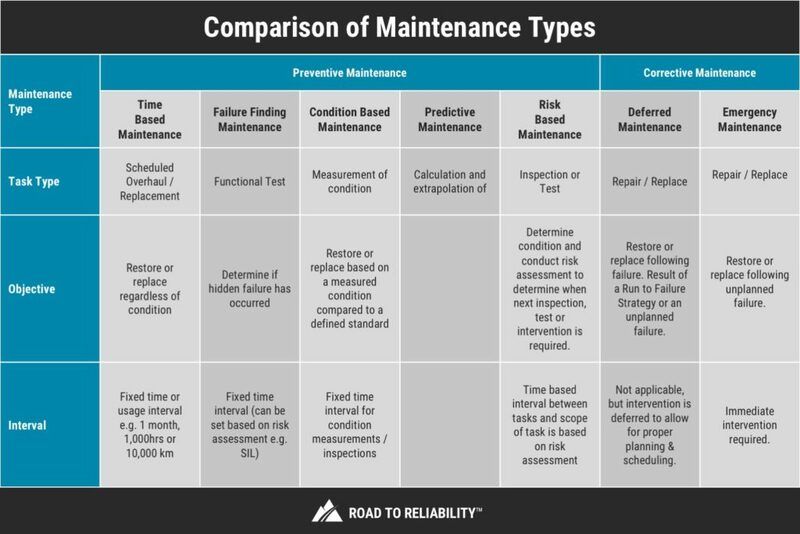 When to use condition based maintenance. And how to use it. When we do preventive maintenance we are doing a task before a failure has occurred. That task can be aimed at preventing a failure, minimising the consequence of the failure or assessing the risk of the failure occurring. When we are conducting corrective maintenance the failure has now occurred and we are basically reinstating equipment functionality. To be clear, corrective maintenance can be the result of a deliberate run-to-failure strategy. Preventive maintenance (or preventative maintenance) is basically a type of maintenance that is done at a regular interval while the equipment is still functioning with the objective of preventing failure or reducing the likelihood of failure. Preventive maintenance can be time based i.e. every week, every month or every three months. But preventive maintenance can also be based on usage e.g. every 150 cycles, every 10,000hrs or like your car: service every 10,000km. In the following paragraphs I will explore each of these types of maintenance in more detail including when you should consider using them. Time Based Maintenance refers to replacing or renewing an item to restore its reliability at a fixed time, interval or usage regardless of its condition. This is what Moubray calls Scheduled Restoration or Scheduled Discard tasks in his RCMII book. I limit the use of that phrase as for some reason people then jump to the conclusion that other maintenance is not scheduled. When in fact of course all maintenance should be scheduled through our Weekly Schedule. The only exception would be Emergency Maintenance, which due to its very nature of requiring immediate attention cannot be scheduled. The purpose of Time Based Maintenance is to protect yourself against the failure of known wearing parts which have predictable Mean Time Between Failure (MTBF) i.e. Time Based Maintenance assumes that the failure is age related and a clear service life can be determined. Or, that it’s simply not worth the effort to assess the condition and a time based replacement is more economical and still (reasonably) effective. Time Based Maintenance can never effectively manage non-age related failure modes and therefore should only form a small part of your overall maintenance program as >70% of the failure modes in your plant are not age related (refer to the article 9 Principles of Modern Maintenance). Failure Finding Maintenance tasks are aimed at detecting hidden failures typically associated with protective functions. Think pressure safety valves, trip transmitters and the like. This type of equipment won’t be required to function until something else has failed. That means that under normal operating conditions you will not know whether this equipment is still functional i.e. the failure modes are hidden. And since these failures are hidden, you’ll need to find them before you are relying on that equipment to protect you. It’s important to realise that failure finding maintenance tasks do not prevent failure but simply detect it. And once detected you’ll have to repair the failure you found. Failure Finding Maintenance is conducted at fixed time intervals typically derived from legislation or risk based approaches. Risk Based Maintenance (RBM) is when you use a risk assessment methodology to assign your scarce maintenance resources to those assets that carry the most risk in case of a failure (remembering that risk = likelihood x consequence). As a result, equipment that has a higher risk and a very high conseauence of failure would be subject to more frequent maintenance and inspection. Low risk equipment may be maintained at a much lower frequency and possibly with a much smaller scope of work. When you implement a Risk Based Maintenance process effectively you should have reduced the total risk of failure across your plant in the most economical way. Risk Based Maintenance is essentially preventive maintenance where the frequency and scope of the maintenance activities is continuously optimised based on the findings from testing or inspection and a thorough risk assessment. Examples of Risk Based Maintenance would be Risk Based Inspection as applied to static equipment like vessels and piping or even pressure relief valves. Most failure modes are not age related. However, most failure modes do give some sort of warning that they are in the process of occurring or are about to occur. If evidence can be found that something is in the early stages of failure, it may be possible to take action to prevent it from failing completely and/or to avoid the consequences of failure. Condition Based Maintenance as a strategy therefore looks for physical evidence that a failure is occurring or is about to occur. Thinking of CBM in this way shows its broader applications outside condition monitoring techniques often only associated with rotating equipment. 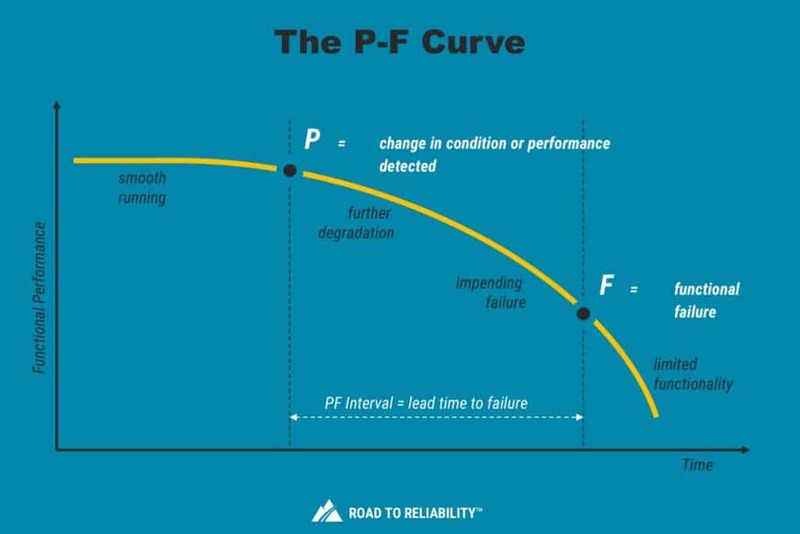 The curve shows that as a failure starts manifesting, the equipment deteriorates to the point at which it can possibly be detected (point “P”). If the failure is not detected and mitigated, it continues until a functional failure occurs (point “F”). The time range between P and F, commonly called the P-F interval, is the window of opportunity during which an inspection can possibly detect the imminent failure and give you time to address it. It is important to realise that CBM as a maintenance strategy does not reduce the likelihood of a failure occurring through life-renewal, but instead is aimed at intervening before the failure occurs, on the premise that this is more economical and should have less of an impact on availability. In other words: condition monitoring does not fix machines and condition monitoring does not stop failures. Condition monitoring only lets you find problems before they become a failure. A common rule of thumb is that the interval between CBM tasks should be one-half or one-third of the P-F interval. How much more effective CBM is above breakdown maintenance depends on how long the P-F interval is. With plenty of warning the rectification can be planned, materials and resources can be mobilised and breakdown prevented (though production is still stopped for the maintenance duration). When the P-F interval is only a few days the resulting organisational and workplace actions are much like a breakdown and the value of CBM is largely lost. For CBM to be effective as a strategy, early intervention is essential. This requires an efficient and effective process for data gathering, data analysis, decision making and finally intervention. For failure modes where the P-F interval shows a large variability, condition monitoring is not an effective strategy. 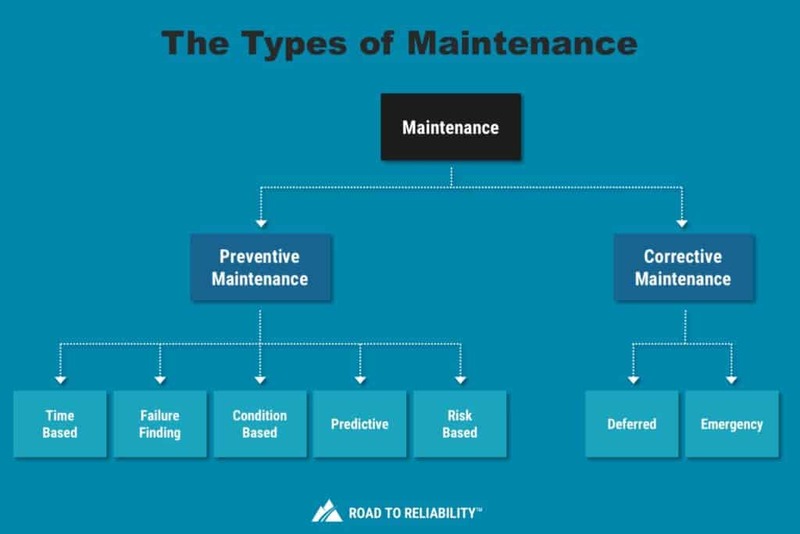 If you’re interested to find more about how to best manage failure modes don’t forget to check out my article Reliability Centered Maintenance – 9 Principles of Modern Maintenance. Up until recently when people spoke about Predictive Maintenance (PDM) this was essentially as a synonym for Condition Based Maintenance. But in my view with the advent of Artificial Intelligence, much lower costs of equipment sensors (IIoT) and machine learning there is clearly a difference appearing between Predictive Maintenance (PDM) and Condition Based Maintenance (CBM), at least in my view. I see Predictive Maintenance as an extension, a more advanced approach to CBM where we use potentially many process parameters gained from online sensors to determine if our equipment is moving away from stable operating conditions and is heading towards failure. There are a lot of (very large) companies actively moving into this space and it is certainly a fast-moving and exciting part of our discipline as Maintenance & Reliability professionals. However, I do still believe that even the most advanced Predictive Maintenance approaches need to be underpinned by sound reliability principles and understanding. A Run to Failure or Corrective Maintenance strategy only restores the function of an item after it has been allowed to fail. It is based on the assumption that the failure is acceptable (i.e. no significant impact on safety or the environment) and preventing failure is either not economical or not possible. Apart from being the outcome of a deliberate Run to Failure strategy Corrective Maintenance is also the result of unplanned failures which were not avoided through preventive maintenance. A run to failure strategy can effectively be used for general area lighting, smart process instrumentation (without trip functionality) etc. where the consequence of failure is limited and would not necessitate a need for an urgent repair. When opting for corrective maintenance as a strategy it is essential to ensure that the failure modes under consideration do not have the potential to become Emergency Maintenance. You see, if you adopt run-to-failure for equipment that once it has failed must be restored immediately to have doomed your organisation to a reactive maintenance environment. A reactive maintenance environment is not where you want to be. It is more expensive, less efficient, and less safe. So although a run-to-failure strategy can be a good option, make sure you decide wisely. And that was very deliberate because it is so essential that we absolutely minimize the amount of Emergency Maintenance we allow into our organisations. As I already pointed out above Emergency Maintenance is expensive, various sources have suggested that Emergency Maintenance is 3 to 5 times as expensive as ‘normal’ preventive maintenance. Emergency Maintenance typically leads to longer equipment outages and more production impact. And it is less safe. So when a corrective maintenance work request is raised it is essential that you prioritise it properly to make sure that where possible you defer the work request and give your team the time to properly plan and schedule the work. If you want to read more about prioritisation of corrective maintenance have a look at the article You Will Fail Without Planning & Scheduling. Emergency Maintenance is corrective maintenance that is so urgent that it breaks into your Frozen Weekly Schedule (you do have one don’t you?). It upsets your plans and schedules and typically throws everything into disarray. Some people thrive in this type of environment and often get heralded as heroes when they’ve worked 16hrs non-stop to get production back online. But when it comes to the Road to Reliability it is a dead end. So Emergency Maintenance is the one and only maintenance type that we really want to avoid as much as possible. In fact, World Class organisations ensure that less than 2% of their total maintenance is Emergency Maintenance. How much Emergency Maintenance do you have? and how the interval between the tasks is determined. An efficient and effective Preventive Maintenance Program will have a mix of all these different types of maintenance. So what is breakdown maintenance? And frequently asked question is ‘what is breakdown maintenance’ and as it’s not in my explanation I thought I’d just covered it here briefly. As far as I am concerned, breakdown maintenance is simply corrective maintenance and not another type of maintenance in itself. In the case of breakdown maintenance you’ve had a failure and so now it needs to be fixed. And depending on the risk associated with that breakdown it could be urgent or less urgent. But, in many people’s mind, breakdown maintenance is urgent maintenance, maintenance that needs to be done right now i.e. Emergency Maintenance. And if that’s the case for you, you know what to do: get rid of it! Preventive maintenance covers multiple types of maintenance that are used before a failure has occurred. Predictive maintenance is a form of preventive maintenance. When most people talk about preventive maintenance they really mean Time Based Maintenance which is a repair or replacement on a fixed interval irrespective of the condition of the equipment. The interval can be time-based (days, weeks or months) or usage-based (operating hours, cycles or km). And what about Autonomous Maintenance? The above table of types of maintenance does not include Autonomous Maintenance or Autonomous Care (also referred to as Front Line Maintenance in other organisations). The CLAIR (Clean, Lubricate, Adjust, Inspect and Repair) activities conducted under Autonomous Care are essentially a combination of the above strategies, but conducted on a higher frequency by frontline staff. What Types of Maintenance Do You Use? Every time we use the preventive maintenance of drilling material and equipement to be really used and avoiid the corrosion . Thanks for the comment, indeed many corrosion mechanisms are time / duty related and can be effectively managed with a time based preventive maintenance regime. However, be careful with other random corrosion mechanisms like stress corrosion cracking which is not age-related and really needs to be designed out or managed through methods than time based PM. 1.How many of percantage preventive maintenance,predictive ,and corrective standart world class. 2.If we do activities of predictive,preventive and corrective,its call wrench time. Hi Rizaldi, I don’t like to give percentages for PM, CBM and CM ratios as people just take those numbers and forget to think. Instead I always like to point out that non-age related failure modes are typically > 70% of the failure modes we need to manage. And non age related failure modes are best managed with some kind of condition assessment so that gives you some indication. But also remember that often we have to do preventive maintenance to meet compliance / legislative requirements. Inspections, vibration rounds, lubrication rounds, … are clearly preventive maintenance, but what if the preventive maintenance (e.g. a vibration reading, corrosion under insulation, …) found a possible error (upcoming bearing damage, a corrosion mechanism that cab lead to failure, …), does the repair or bring back in original state still fall under preventive maintenance or better to say proactive maintenance? Would you allocate all the costs to preventive maintenance or would you only allocate the cost for the initial inspection to preventive/proactive maintenance and allocate the repair/bring back to original state to corrective/reactive maintenance? I would prefer the former as the equipment did not fail yet. Hi Tom, If during a PM you find a defect that will eventually lead to a failure then I would consider correcting that defect still a PM as you are still preventing the failure from occurring. I like to keep things simple and therefore prefer a simple differentiation of it’s either a PM (before failure) or a CM (after failure). So all work and costs associated with preventing failures are PM costs. What you can do in some CMMS systems is to put a flag on the new work and mark it as follow-on work from a PM. That can help you determine how effective your PM is in finding issues. PS I’m not a big fan of the phrase proactive maintenance as it seems quite meaningless to me. All you PM’s are proactive in my view and where you have accepted a run to failure strategy I would even consider the resulting CM’s proactive as you have made a deliberate choice to allow that failure to happen (i.e. you have been proactive). I prefer to use the distinction of reactive vs proactive more around the overall maintenance culture rather than maintenance tasks. At that level i.e. a proactive or reactive maintenance culture makes sense to me. All take data from equipment and equipment not stop, it call Predictive Maintenance/Condition Based Maintenance.And then using data, make trending. From trending you could predict. Unfortunately people are very conservative. Refusal of TIME BASED MAINTENANCE (TBM) them seems like a utopia. The lowest level is afraid of losing the job, Middle-level managers do not want to take responsibility for themselves, and senior management has an understanding of maintenance at the car care level. It will give you good ammunition to have those discussions with managers and leaders stuck with old beliefs. Thanks for the detailed description of maintenance. It was very informative. I have a different view on this. In my opinion, Maintenance are of only 2 types namely – Planned & Unplanned. These are the 2 types which I am concerned about. Target is to achieve more of planned maintenance. We do all predictive, fault finding to avoid Unplanned maintenance. That is when we achieve reliability. I do not like talking in terms of PM, CM, PdM etc as it makes the picture blurred. To get further details on the picture I like to have split for Planned i.e. CBM, PdM & PM. It gives me a clear picture whether we are doing PM or PdM more. I am not saying anybody else is doing it in a wrong way. It is just my way of doing things. Hi Narender, I think we are actually very aligned in that your planned maintenance is the equivalent of my preventive maintenance and your unplanned maintenance is what I would call corrective maintenance. I prefer to keep the planned and unplanned distinction for (corrective) maintenance to identify those maintenance tasks that have not been planned i.e. prepared beforehand and therefore are typically very urgent, inefficient and a costly way to do maintenance. This is what I call emergency maintenance. And then you have planned (i.e. prepared) corrective maintenance where we have had a failure, but still are taking the time to plan the work so we get good efficiency. I fully agree with what you state here. I am regularly delivering courses on railway maintenance, and i found myself so often faced with misunderstandings on basic concepts (even within professionals) that i developped a module of very basic maintenance concepts. Doing so i also discovered, even if this is odd, that those concepts are not always properly defined in academic books, and even in some standards. I may have 2 complements though. First is about Corrective vs preventive mn. As you say, they correspond to a decision, a strategy adopted, or as some books state, an evolution to “reactive” to “proactive”. The original poor or unknowledgeable maintainer would find himself in the reactive one, enduring failures that need to be repaired. But it could be misleading in terms of classification of tasks. They do not represent a mathematical “partition” of all the maintenance tasks. If one wanted to list out all maintenance tasks for a particular equipment, he would not be able to put 2 different lists. Because they do overlap. This is to me a reason of many confusions in non specialist minds. Some same tasks could be performed under corrective or preventive modes. For example greasing a door latch could be performed either once a door ceased to function (one cannot or cannot with sufficient ease slam it), i.e. in corrective mode, or when the door function is ok, or start to be less easy to slam (goes beyond the “p” point of the p-f curve), i.e. in preventive mode. Exact same task. Another example would be the replacement of a car wheel, that can be performed on a flat (failed) tyre or before the tyre gets too worn. Still exact same task, same series of steps. Many tasks can be performed exactly the same way, but just under different circumstances. This is also true that in some cases the tasks will somewhat differ, because when a failure occur some additional damages could have happened leadind to the necessity to accomplish other tasks when doing a repair. But not always. This seems to be just a small detail, but it is enough to create a confusion in terms of classification and logic for those who would think that preventive and corrective would represent 2 distinct categories of the maintenance tasks listed in a manual (Unfortunately many manuals do this mistake or this simplification). Should a clear-cut split be made among all maintenance tasks, there would be 2 that are really distinct. There are on one hand those tasks dedicated on restoring function (greasing the door, changing the wheel), the interventions, and on the other hand those other tasks dedicated to assessing the state or condition of the equipment. Involving different skills, different tools, different process. Could be a measurement (size, current level, vibration level, reaction speed, aspect, sound, smell, etc) or some functional check leading to a conclusion regarding the equipment condition or level of performance regarding a function. It does not necessarily involves the use of a specific device, could be a simple glance to the wheel wear level, or a manual test of the latch resistance. It is where observation and experience comes into place in order to perform intervention only when appropriate. It involves other skills. When not performed, the intervention is done “blindly”. This is the glance to the shoe leading to the potential decision to polish it. Takes many glances before a polish is performed, usually ! They are usually simple, less expensive than interventions. It is what you do when you are lazy in your personal life, or “want to optimize” maintenance in your professional life. These tasks could be called “monitoring” tasks. Probably a better term could be used, i personally prefer the term “surveillance”. “Monitoring” often has the connotation of something made continuously (which is not necessarily the case here), and also can give the impression there will be some physical monitor (screen) involved, which is not the case either. As opposed to intervention where something is “made” to the equipment to restore its function, here nothing is made but the condition regarding a function is checked or assessed. It can be continuous or not, can involve a tool/ device or not. Condition monitoring maintenance, simply put, is this maintenance mode where some surveillance is preliminarily performed, with or without device, prior to intervention. This tends to optimize maintenance because it is based on solid and knowledgeable observation of a condition, and interventions which are usually expensive tend to be minimized. Surveillance activities are usually less expensive and shorter to perform, then less expensive. It could be said that performing preventative imposes to perform surveillance or monitoring tasks. Otherwise there are no garanty to remain preventive. This is why the “time-based” maintenance is weak. Involves no surveillance. This is a blind type of maintenance where interventions are performed disregardefully of equipment condition. This distinction is important for understanding, and it has the advantage of being “logical”. Unfortunately books rarely specify this distinction, which leads to mixing oranges and apples under the same general term of “maintenance tasks”, which not enough precise to correctly describe the other maintenance concepts within preventive maintenance. To me this distinction is key for understanding, and clearly missing in the maintenance litterature. Hope this will help complement your nice work ! Thank you Ivan for your detailed reply. Great point that the same task could be deemed preventive or corrective depending on when the task is done i.e. before or after failure. Thank you for the interested topic. I have confused about preventive maintenance and which better: renewal or replacement of complex assets. Hi Debo, thanks for your comment. Whether you should replace or repair/overhaul a complex asset would depend on factors like the cost of repair ve cost of replacement and whether you expect to get the same reliability and life out of a repaired asset vs a new asset. 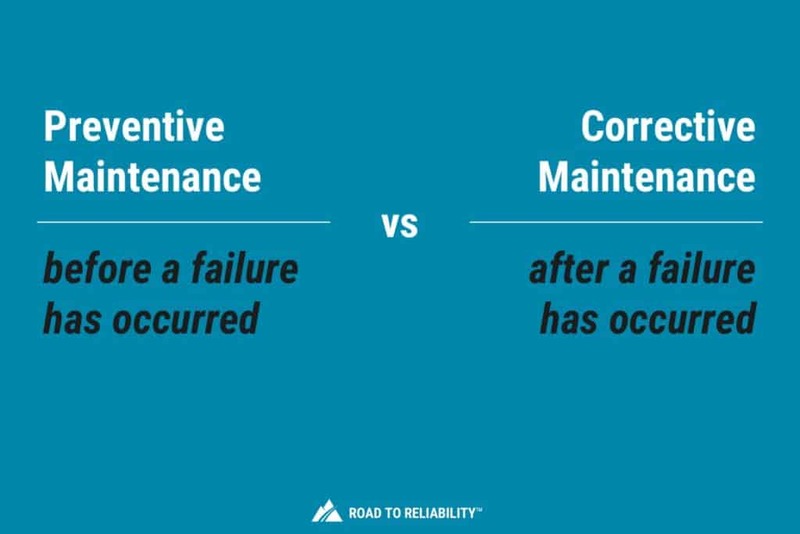 Don’t forget that for a complex asset the overall failure pattern would most likely be random (see my article on the principles of modern maintenance) in which case time-based repair or renewal would not be an effective strategy. Good share Erick,at our site we clasify type of maintenance Proactive (PM,Pdm,Sca)maintenance and Reactive maintenance(emergency),PM we implement based on ,by time base equipment recomended,Pdm we implement by critical equipment mapping,Sca we implement by Work request and inspection. It is really good reading. In our site (food & beverage company), we use PM (Preventive Maintenance), CM (Corrective Maintenance), and BD (Breakdown Maintenance). We have certain schedule for each equipment. Starting from weekly, monthly, 3 monthly, 6 monthly, yearly, 2 year, and so on. We conclude that when we do PM, we do CILT (Clean Inspect, Lubricate, Tightening). Some occasions when we found wear parts (the machine is still okay to run). But we don’t have spares in our store. So we need to order it to supplier and wait for part arrival. When the parts comes to our site, and when we do the replacement we call it by Corrective Maintenance. This type of maintenance conducted only if the machine stop in the middle of production. The cause will vary from wrong operational, equipment failure, and many more. Because it easier to note number of breakdown in one week, we use this for our maintenance priority. Thanks for sharing this informative and clear work. The subject is very interesting. The good point you mentioned it. We have to think about principles, With this platform and the main classification is it before or after. My point for further discussion what about design out maintenance as way to improve capacity or reduce maintenance and other point opportunity maintenance. The productivity is always high .